The two most common things I hear when sharing my jewelry-making area are: “You don’t have a kiln in your studio?” and “You don’t have propane and oxygen in your studio?” Nope. I sure don’t, on both counts. The next question usually asked is “why?” This answer lies with my dear husband. Him, our homeowner’s insurance, and some logistics, that is. And rather than buck the system, I just go with it and work around these little things. I will say, if I didn’t have space in our outdoor shed for using my kilns and torches (those powered by fuel other than butane), I might have more fight in me, but I can make it work, so I leave it alone. “Making it work” for me means using a micro torch fueled by butane in my home studio. I know micro torches don’t appeal to everyone. And working with butane may not always be what you need for the task at hand. But, micro torches and butane really work well for my needs, and so, I’m happy. There are a lot of other artists who are also happy working with butane and a micro torch; so much so, they’ve done videos and books on the subject! Enter Kate Ferrant Richbourg, Denise Peck, and Cassie Donlen — the queens of the micro torch! In all seriousness, these ladies have shared so much on how to maximize your micro torch and butane fuel, you could create a lifetime’s worth of jewelry inspired by their techniques. 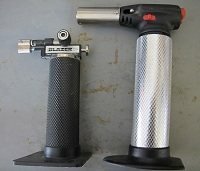 When shopping for a butane torch, take a good look at it. Is it mostly plastic with a minimum of metal parts? If so, put it back on the shelf, regardless of the great bargain. Torches kept on for an extended length of time (during the soldering process) get hot. That heat centers around the top of the torch and torch head. Too much plastic, and you may find that your torch head may slightly melt. That will affect the delivery of the butane to the torch tip, which makes the torch impossible to light. Torches that are mostly metal can be used for extended periods of time without fear of damage. Six essential set-up needs: These are my six essentials. My micro torch (in this case, the Max Flame), my kiln brick firing surface, a quench cup, soldering tweezers, safety glasses, and a jellyroll pan as my heat-proof protective surface. I also have a fire extinguisher next to my workbench. Better safe than sorry! I’ve never had to use it, knock on wood, but safety first is best. A butane micro torch isn’t much use unless it’s filled with fuel. I use regular butane fuel from the hardware store for refills. Although you may think it’s best to use “triple-refined” fuel to keep your torch head clean, I use regular fuel right off the shelf, and my torches work great. This is not an endorsement, just my experience. When I fire up my torch, I always have my window open for good ventilation. Butane is a clean-burning fuel and the burn time for soldering is relatively short. The main source of potentially harmful fumes, in my opinion, is what you are heating. Melting solder and heating flux and metal do give off a small amount of fumes. Working in a well-ventilated area will keep the fumes at a minimum. You can always wear a respirator as well as a have a carbon monoxide monitor for added protection. You absolutely need a fireproof work surface, such as a piece of sheet metal or large ceramic tiles, to protect your table. Then, for your soldering, you need a Solderite board or charcoal block. For extra protection, I put my charcoal block in an annealing pan filled with pumice. 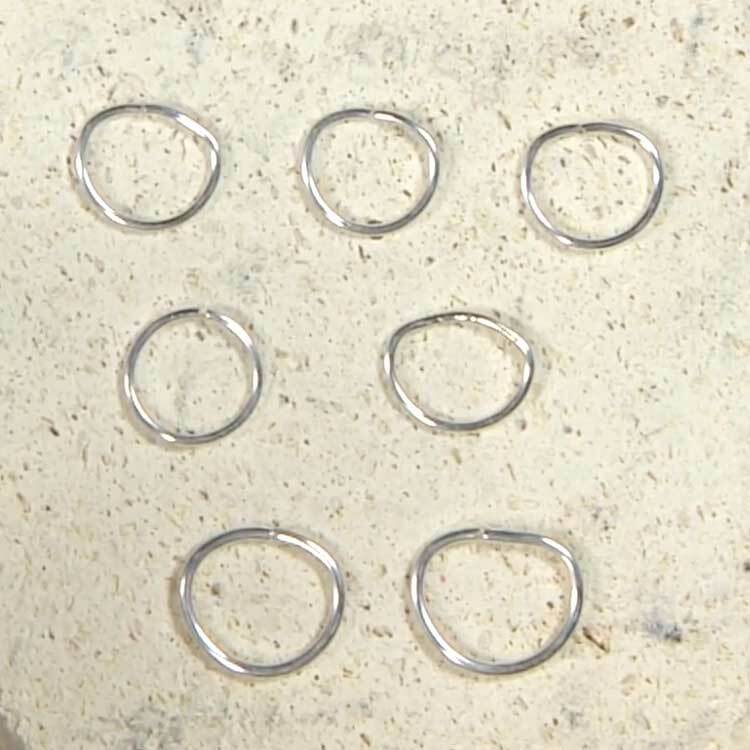 If you’re working with fine silver wire, you don’t need solder because it fuses to itself. But if you’re soldering sterling or copper, you’ll need flux and solder. Flux is a paste that helps retain the heat where you want it and helps to make the solder flow. I dedicate pliers, tweezers, and picks for flame work, so I don’t ruin my good tools. Refuel the torch before each use to ensure you will have the hottest flame. This will also help to keep your torch from running out of fuel in the middle of a task–such as just when your solder is about to flow! 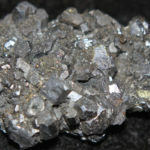 Scraps of silver almost instantly turn into perfectly round silver balls when heated with a micro torch. 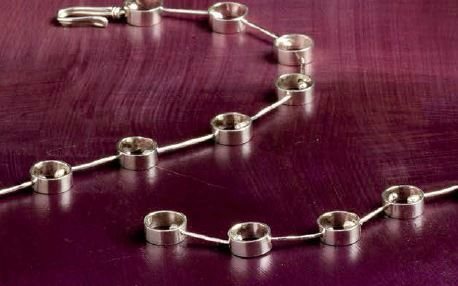 You can create silver accent balls in almost any size to embellish your wire or metalwork jewelry designs. The most basic rule of soldering is that you must heat the entire piece, not just the join (the place where the two metal ends meet). Focusing on the join alone results in just burning away the metal there. Instead, slowly and methodically rotate the torch around the entire piece until it’s all very hot. Then focus on the join to make the solder flow (or fuse the fine silver), then immediately pull the flame away. 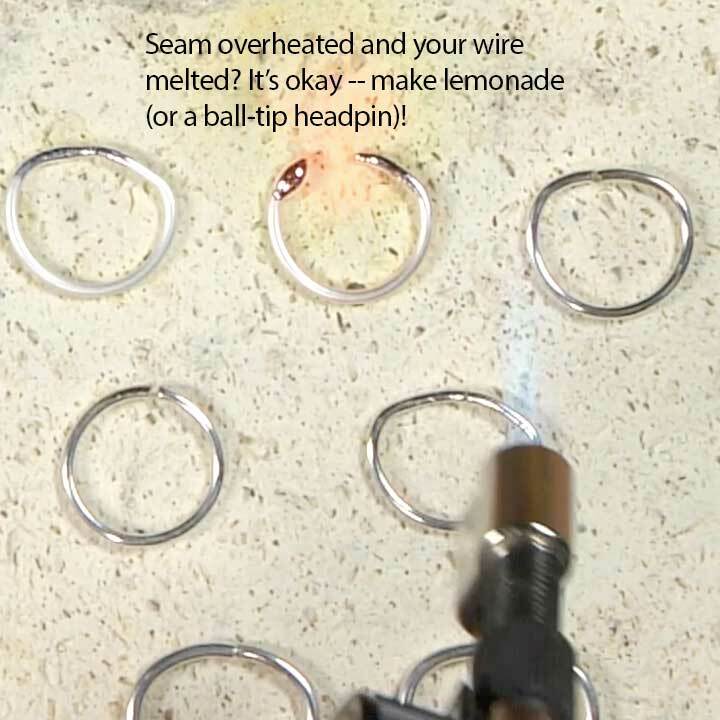 There’s a limitation to how heavy a gauge sheet and wire you can use, and how large your pieces can be in micro torch jewelry making, because butane torches don’t get much hotter than 2500 degrees Fahrenheit. Larger pieces require a lot more heat. 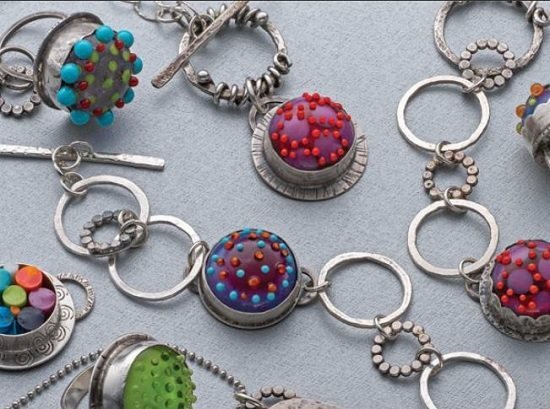 But if you’re itching to expand your repertoire into making bezels for cabs or resin, you can definitely get that going with micro torch jewelry making. When soldering or fusing multiple pieces on a block at one time, keep the joints or seams all facing the same direction so you have an easy point of reference for where to aim the heat. When fine silver is almost ready to fuse, it will appear more whitish in color in comparison to the bright shine you start with. 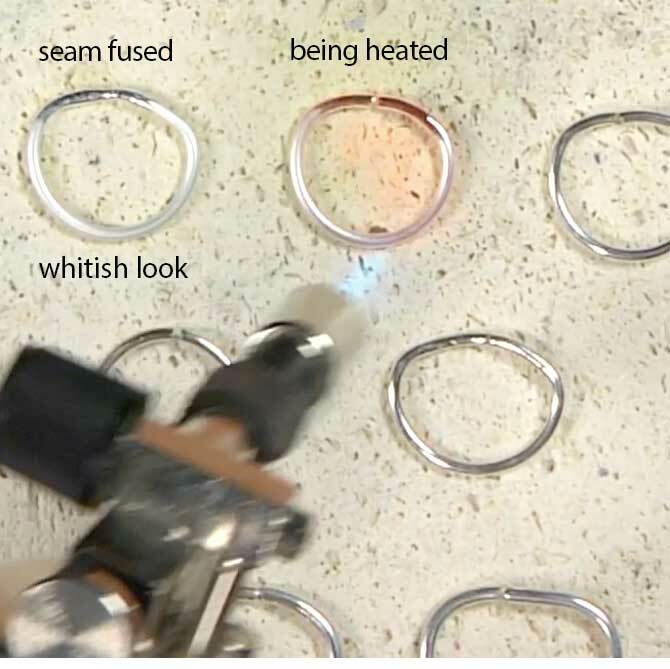 Once it appears whitish or powdery, focus the heat on the join and it will fuse. As soon as you see the seam join, remove the heat to avoid melting the silver. Cassie demonstrates what happens when you apply too much heat after your join is fused. 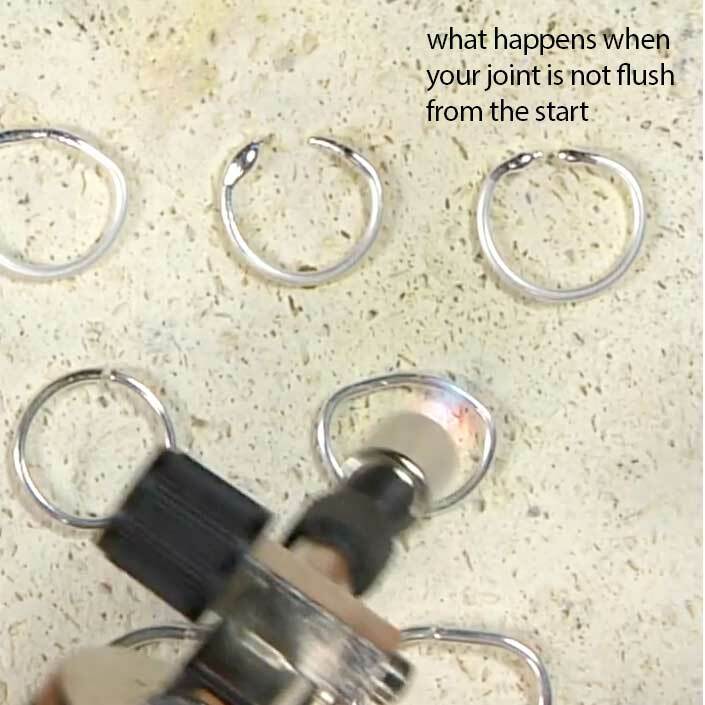 She shares what happens when you don’t start with a good join before heating (top right ring). These are all really great teaching examples to help with “what not to do” but also to show life will go on if it happens to you. Always work on a fireproof surface. Wear safety goggles made for filtering flame flare. Never touch your pieces right out of the flame. Have a quenching bowl of water to cool your pieces. Dedicate some cheap pliers for your flamework so you don’t ruin your good tools. Remember the end of the torch remains very hot even after you turn it off. From fusing fine silver to soldering bezels — these ladies show us the ins and outs of using a micro torch and butane. 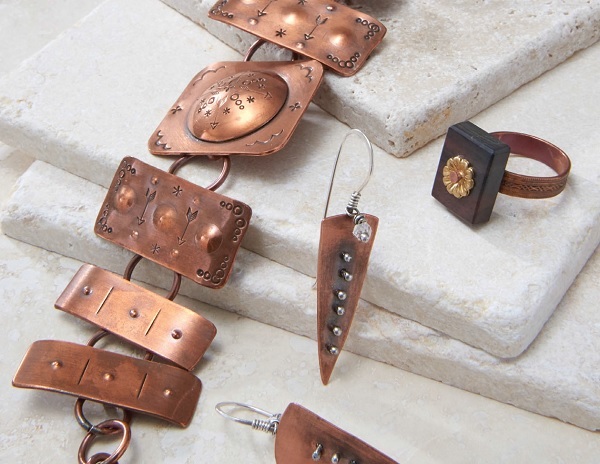 Along the way, they also share some really beautiful jewelry designs. So, if you’re also short on space or approval to use fuel other than butane in your studio, happy days are ahead for you, too. Pull up a chair, download your videos, then get making! 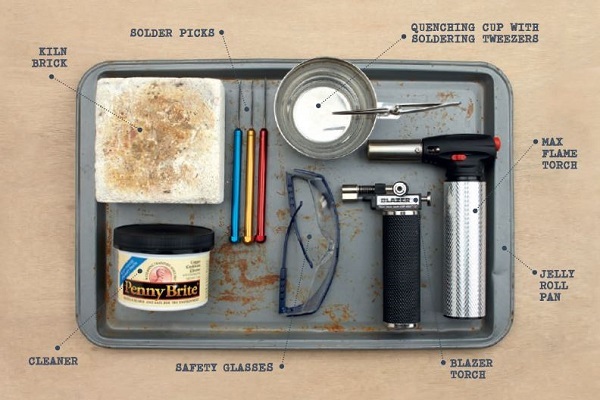 Add these micro-torch jewelry-making videos and books to your library!